They were so skilled they never needed to touch us - none of us were bruised or battered because we couldn't get that close to the ball. Nevertheless, at the end of the day our egos were intact. No one could say that our losses were due to anything but the difference in skill and organization. 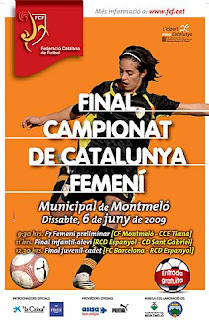 We felt like we learned a lot - about skill, about playing smaller games (5 & 7 aside are totally different beasts from a full field game), and about the ethos of Catalan futbol femení. Our opponents enjoyed themselves immensely, but not at our expense. They were ferocious and unforgiving, but also welcoming and respectful. Model sportswomen. Even the thirteen year-old (seriously) who captained one of the best teams in the tournament impressed us with her graciousness. Yesterday, on the other hand, I played on the losing side of an entirely different match. It was a hard game - we started two players down and never had more than ten on the field. But I've had a lot of fun playing outnumbered with the same group of women - being down a player or two can really pull you together. The problem was our opponents. They fouled hard and talked trash afterward. They gave elbows when the ball was nowhere to be seen, and got angry if you touched them. One woman shoved our striker to the ground after the referee had blown his whistle (calling our striker for a foul). Where our player's foul had been unintentional, there was no mistaking the defender's two-handed shove to the ground. Now, I like the physical and the psychological aspects of the game - I know that a certain amount of theatrics is a part of the game. I once tracked an opposing striker all over the field - she was determined to get a shot off even if I was marking her. I knew this, and stuck to her - I wanted to engage her ego so she wouldn't do the right thing and pass to her teammates. She lost possession, the ball went out, and she turned around and shoved me by the shoulders, nearly knocking me over. The ref didn't see it, and I was furious. I was quite rightly subbed out after that because I was distracted by my anger. On the sidelines, a veteran Hackney player gave me the best advice for a situation in which a player deliberately lays her hands on you in a match - just give her a cool smile and say "come on love, give us a kiss." If your opponent can't handle a line like that, she's likely to pull a Zidane & draw a red card for her team. I try to keep that in mind when things get heated. You are always better off not taking your opponent's theatrics too seriously. If they are mad at you, it's because you are frustrating them. Staying cool will only make them more frustrated. And you have to keep your cool if you are going to stay focused. Yesterday's opponents spewed endless insults from the field and from the sidelines. They yelled at each other, at the referees, and at us. They seemed to play a rather joyless game. Given that we only fielded ten players and didn't have a single sub on a very hot and sunny afternoon, we should have lost that game by miles. They might have played a relaxed game, knowing it would be just a matter of time before they would break us. They had a lot of individual skill on their side, but somehow didn't quite gel as a team. I think it's because they were so focused on hating us. We didn't score (our poor striker faced their back line solo), but we kept them to nil until the last ten minutes. By that point, I know I just couldn't make the runs that I needed to. We didn't let those goals get us down, though, and played optimistically - if breathlessly - right until the end. It was an honorable loss. But I don't think theirs was an honorable win. In fact, quite a few of their players couldn't be bothered to shake our hands at the end of the match. As I left the field, my mind went back to the Catalan tournament. Teams not on the field applauded my team from the stands. The team on the field didn't give us an inch of room, and it felt like a sign of respect. We felt everyone rooting for us, because they wanted to see what we could do. I'd lose again to those women in a heartbeat. They kicked our asses, and totally won us over. Useful advice from the Hackney player! The worst, most frustrating insult I had on the pitch was a girl who kept waving her hand at me dismissively and saying to her team mates "don't worry about her". It drove me crazy.